Headquartered in Basel, Switzerland, the Baloise Group is a European provider of insurance and pension solutions. It positions itself as an insurer with an intelligent risk-prevention concept, the “Safety World”. The Baloise Group employs over 8,000 people with more than 200 trainees and interns. The Baloise Group recently revamped its recruitment process and implemented a new social media strategy (including a dedicated blog), in order to attract more people to their career website and improve the conversion rate. Baloise made its career site mobile-friendly, user-oriented and filled it with relevant information for interested candidates. To ensure an even better candidate experience, the Baloise team also needed to modernise its application workflow. In the background, Baloise uses Taleo’s e-recruiting system. Candidates needed to fill out their entire education and work history in order to provide a meaningful application. Depending on the candidate’s experience, it could prove a long and tedious task. The “Apply with” widget is a one-click application tool, developed by Textkernel, that allows candidates to easily apply by uploading their CV or using their online social media profile. In the background, Textkernel’s CV parser analyses and extracts the data from the CV or social media profile and automatically fills this information into the correct fields in Taleo. This saves candidates a lot of time, since they don’t have to manually fill in the online form anymore and can even apply via a mobile device. The data from the CV or social media profile is automatically filled into the correct fields in Taleo’s e-recruiting system. The candidates are shown a screen pre-filled with basic information extracted from their CV or profile (such as name, email, contact details). After verifying this information they can send in their application. The results of the 3-month pilot phase are impressive. Candidates can now apply in just a few clicks, shortening the process dramatically. Manual entry of information is no longer necessary. This can save up to 30 minutes of the candidate’s time, significantly improving their application experience. The possibility to apply from mobile devices is also welcomed by candidates and results in a higher conversion rate. Cathrin Hermann who coordinated the project was impressed by its smooth implementation: “I was amazed by how quickly we were able to offer such a powerful and innovative solution, without interfering with the workflow of our recruiters”. 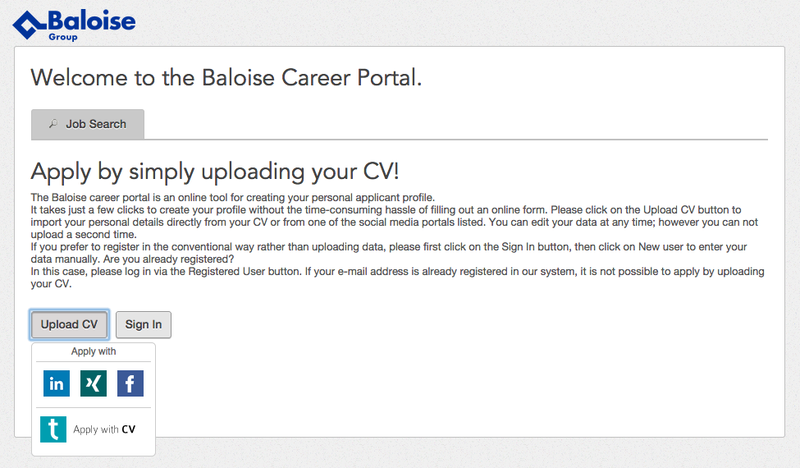 All jobs on baloisejobs.com are now enabled with Textkernel’s “Apply with”-widgets. This allows Baloise to offer its applicants a quick and easy application process that is also accessible via mobile, contributing to a positive candidate experience.